I'm having the strangest issue since updating to OS X El Capitan. My "Open File" dialogs show the sidebar but all my main (and useful) locations are missing. Take a look at this screenshot. 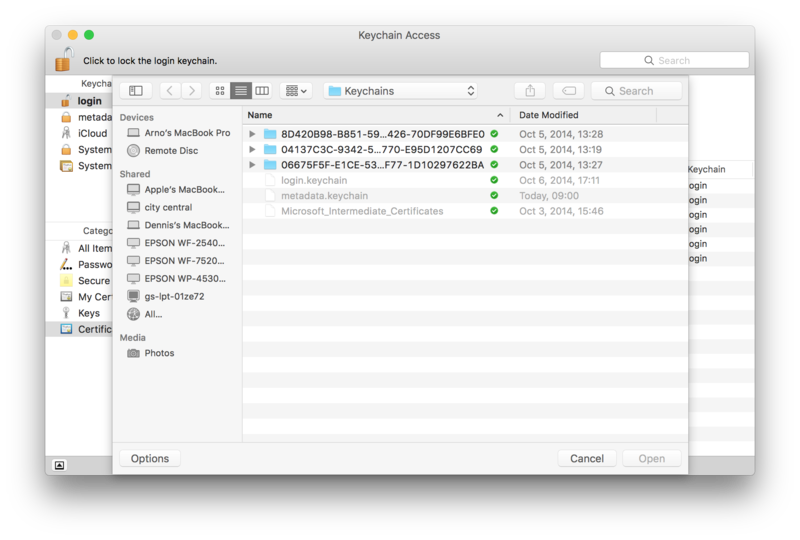 This screenshot shows Keychain Access but this happens in Safari when I'm trying to attach a file to Gmail for example, or uploading an image to Facebook. What I would like is for the sidebar to show my home directories, such as Desktop, Documents, Downloads, etc. Go to your user library in Finder. Hold down ⌥ while opening the Go menu and click Library. Navigate to the Preferences folder. Restart or log out and log back in again then empty the trash and try again. You can also relaunch Finder if you don't want to reboot or log out. Right click on Finder icon while you're pressing ⌥ and you'll see the Relaunch option there. 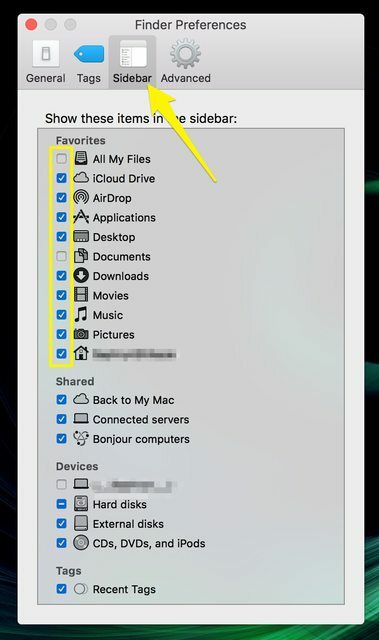 While in a "Open File" or "Save As" dialog box (that doesn't show Favorites), drag any folder to the sidebar. This will create a "Favorites" category in the sidebar that only shows that folder. After rebooting, all of the dialog box sidebars should show Favorites as it appears in Finder, synchronized. I had the same problem. I resolved it by going into the Finder and making a change to the Favorites area (eg dragged a folder in Favorites up one position). After closing the finder window and reopening to make sure the change stuck, I rebooted. File/Open then worked as normal. The solutions above are both complicated and do not work. Kill sharedfilelistd and restart Finder. Problem solved (at least for a week or two according to my experience). Restarting a computer is humilitating! Go to Finder -> Preferences -> Sidebar, and put a check next to all your Favorites. Installing El Capitan might have reset a few of your original settings (it reset my desktop backgrounds). It comes with the territory when installing major updates, but this should fix it. Open a Finder window; you can drag folders onto the sidebar, and they’ll appear under a badly-named “Favorites” section. Weird, but I think I like it. Keeps the plebeians out of trouble, makes it mo’ fancier for power users. 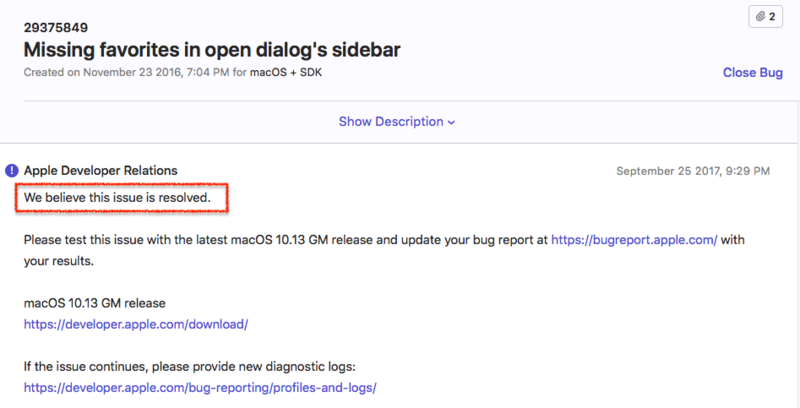 Today I received a reply to this very bug report I posted in nov, 2016. It's resolved in 10.13 GM, according to it. Not the answer you're looking for? 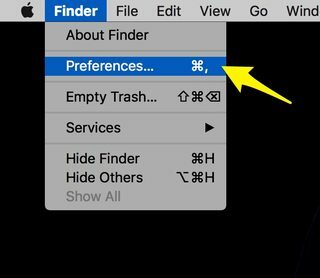 Browse other questions tagged macos finder el-capitan sidebar . Why can't I see my favorite locations anymore when saving a file? Can I get the Media browsers from the File Open dialog in the Finder sidebar? I deleted my Downloads folder, why can't I remove the items pinned to my sidebar? Where did my open file dialog go?